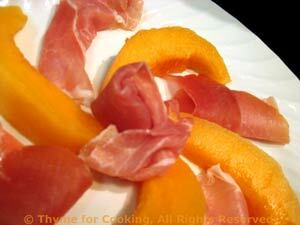 Prosciutto with Melon, a classic from Thyme for Cooking, for summer. 6 - 10 paper-thin slices dry-cured ham, your choice: Prosciutto, Serrano..
Cut the melon in half and scoop out (and discard) seeds. Cut into wedges. How many wedges you serve depends, (you guessed it) on the size of the melon. Arrange wedges on large plates, add ham around/over wedges and serve.